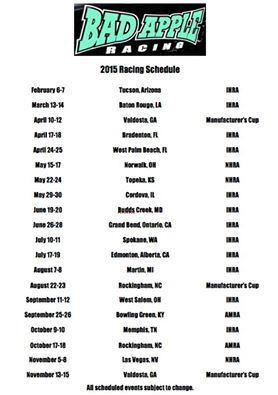 Team HeadBlade and Capone Racing are ready to announce their 2015 Drag race schedule. During the winter break after numerous phone conversations resulting in a trip to the sunny South to test ride for Tracy Kile's Bad Apple racing's Top Fuel bike. That's right-- not a pro dragster that Capone had trained on at Rockingham Dragway in the Fall but all the way to Top Fuel 1,000 horsepower fire breathing smoke belching, wheel up 6 second passes. Capone is one of a very few racers who has stepped from a hot gas powered Pro Modified class to full powered Top Fuel. Although this season will be a learning curve, his performance at West Palm Beach, Fl at Moroso Motorsports Park is a good indication that he can handle the show. 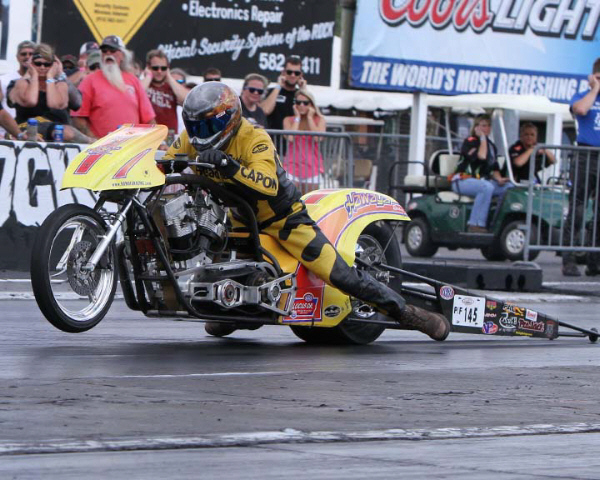 Kile will compete in the IHRA Night Of Fire series and Capone will take Team HeadBlade on the Bad Apple Top Fueler to the 3 events with the ManCup Series, NHRA Topeka and the AMRA Bowling Green race, a good variety of events at great facilities. Capone, "I'm glad that Tracy had the faith to give me a chance with his team and on his bike. This year we'll spend in R & D with a 2nd bike out of the Bad Apple stable and we'll see what 2016 will bring. Mark Godin and I are thrilled to have this opportunity." "It was awesome at Moroso, the facility and personal are first rate. After doing some real good 60 ft (1.15) and 330 ft passes and Tracy was comfortable, he told me "to let it rip". That first 6.73 second at 178.10 mph pass was incredible but the second pass at 6.64 at 203 mph, I'm ready to go racing! The tentative plan is that Tracy will run all the IHRA races and I'll run the ManCup, maybe one NHRA and a couple AMRA's. The schedule is a work in progress, but whatever-whenever-I'm totally ready." Capone’s team consists of Mark Godin, Erin Capone,Lorne Buchanan & Katy Miller. Capone Racing sponsors and friends supporting Capone include: HeadBlade Inc. G&G Engineering, L. Buchanan Co., DAS Performance, Gannos Machine, Energy One Clutches, PR Factory Store, Vanson Leathers and all the staff at Capone Landscape.